archaeologist; b. December 26, 1762; d. June 11, 1839. Lenoir was a pupil of the historical painter, Doyen. He was placed in charge of the magazine established by the revolutionary government for the storage and sale of confiscated property. This depository, the old monastery des Petits Augustins, where is now the École des Beaux Arts, he made the nucleus of a museum, which was opened to the public August 10, 1793. March 30, 1796, his collection received the official title Musée des Antiquités et Monuments français. During the Terreur Lenoir was obliged to act with great vigilance and courage. Bonaparte and Josephine took great interest in the Musée des Monuments français. Eight thousand francs annually were assigned to it under the Empire. Lenoir's main purpose was the preservation of monuments which were especially associated with the history of French art and of the French people. He saved in this way much of the best work of the Mediaeval and Renaissance periods. He preserved also numerous chronicles and documents, public and private. The modern archaeological movement in France derived its principal impulse from his efforts. By decree of the government of Louis XVIII, dated December 18, 1816, it was ordered that the works collected by Lenoir should be returned to their original owners. The tombs of the kings of France were carried back to the church of S. Denis, and various monuments to the churches of Paris. This dispersion was accomplished with haste and disorder, much property was destroyed, and many monuments abandoned in the cloisters and garden of the deserted monastery. Among these were the great portal of the château of Auet and some superb architectural decoration from the chateau of Gaillon, near Rouen, which were rearranged by Duban in the court of the École des Beaux Arts when that building took the place of the old Petits Augustins. Between 1792 and 1816 Lenoir published not less than twelve editions of the catalogue of his museum, and in 1800 his Musée des Monuments français (Paris, 5 vols. 8vo). Folio books with plates were also devoted to this museum. architect; b. January 18, 1752; d. May 13, 1835. He was a pupil of Sir Robert Taylor. His name is especially associated with the transformation of the old Marylebone region in London into the modern Regent's Park, with its terraces and surrounding streets, which was begun in 1811. Regent Street, Park Crescent and Square, Albany, and other adjoining streets were laid out and built from Nash's designs. He completed Saint James's Park and transformed Buckingham House into Buckingham Palace. The first advertisements in the competition for the Capitol at Washington were published in March, 1792. In October of that year Dr. William Thornton of the island of Tortola in the West Indies wrote to the commissioners asking permission to compete. His plans were submitted early in 1793, were much admired by the commissioners, and April 5th were approved by President Washington. The designs which were considered second in point of merit were those of Stephen Hallet, who was placed in charge of the construction of Thorton's design under the general direction of James Hoban, architect of the White House. 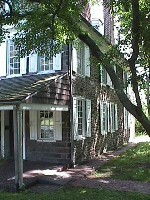 Hallet was discharged November 15, 1794. September 12, 1794, the President appointed Thornton to be one of the commissioners in charge of the District of Columbia, and he had general supervision of the Capitol until his office was abolished in 1802. At this time the north wing of the older part of the Capitol, now occupied by the Supreme Court, was complete, and the foundation and basement story of the south wing were partially laid. The exterior of this part of the building is still much as Thornton left it. 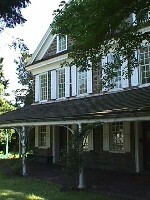 After retiring Thornton was placed in charge of the Pension office and remained there until his death. architect; b. December 20, 1756 (at Paris); d. May 27, 1846. He studied with A. F. Peyre and at the École des Beaux Arts, and won the Grand Prix de Rome in architecture in 1783. In 1793 he established with David Leroy an atelier of architecture at the Louvre. August 25, 1795, when the Institute was created, Vaudoyer became voluntary secretary of the Commission d'Architecture. In 1800 he was appointed architect of the Collège de France and the Sorbonne (Paris), and made extensive additions to those monuments. In 1804 he had charge of the installation of the Institute at the Palais des Quatre Nations. He was associated with L. P. Baltard in publishing Grands Prix d'Architecture, 1804-1831 (Paris, 1818-1834, 2 vols. folio). 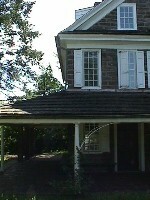 Joseph Paschall et al, Cedar Grove (Philadelphia: 1748-93), images: 2000.05.11. 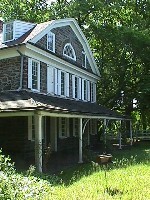 Cedar Grove was built as a farmhouse and as such is distinguished from the majority of the other houses in Fairmount Park. 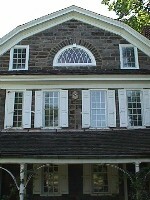 Isaac Wister Morris doubled the house in the 1790s for use as a country place, however, so that while these additions were not out of keeping with the older sections, the final result is not really typical of farmhouses in the region. Edward Teitelman and Richard W. Longstreth, Architecture in Philadelphia: A Guide (Cambridge, MA. : The MIT Press, 1974), p. 124.